SCOTTSDALE, Ariz. — Executives with Zillow and Trulia say they’ll continue to be competitors, even though the top two listing portals are now under the same roof. MLSs will now interact with Zillow and Trulia as one organization — Zillow Group — but not from a brand perspective. “You will see Trulia and Zillow as two distinct brands. They will be competitive,” Beardsley said. In the last few days, as it faces the prospect that it could lose its data feed from listing syndicator ListHub, Trulia has signed seven new agreements with MLSs, bringing up to 132 the number of MLSs feeding listings directly to Trulia, said Trulia’s Alon Chaver. There are more than 60 new deals “in the queue,” Chaver said. In a separate session Beardsley noted that, going forward, any new direct feed contracts with MLSs will be under the guise of Zillow Group and encompass both sites. One audience member noted that when Zillow bought Trulia, the company also acquired realestate.com and its brokerage licenses. What did Zillow intend to do with those licenses? Neither Beardsley nor Chaver answered the question directly. But Beardsley said Zillow Group had no issue putting a noncompete clause into direct feed agreements saying that the company will not compete as an MLS or a broker. “There is no interest in becoming a broker or utilizing that data,” Beardsley said. That noncompete clause would not prevent Zillow from offering MLSs or brokers back-end technology as suggested by another conference speaker, he said. Zillow does have “cool technology” that would be useful to MLSs, he said, pointing in part to Retsly, which Zillow acquired last year. But he didn’t anticipate any such offerings in either 2015 or 2016. Homes.com exec Andy Woolley said the nation’s fourth most popular listing site would continue its focus on audience quality this year. “Last year traffic was up 53 percent and lead count was up” almost as much, he said. Most of homes.com’s audience is organic, Woolley said — less than 3 percent is paid traffic. Homes.com doesn’t have as much traffic as its competitors, but “for our advertisers, quality is more important than quantity,” he said. Realtor.com may now be partly owned by the same company that owns realestate.com.au, but that doesn’t mean that’s where the site is headed, according to Move Inc. exec Russ Cofano. Clareity CEO Gregg Larson had earlier noted that REA Group Limited, which now owns a 20 percent stake in Move as a result of the News Corp. acquisition, “punished the industry in Australia” with its agent advertising fees. REA Group operates realestate.com.au, an Australian site that generates most of its revenue from fees it charges brokers and agents to list their properties. “REA Group in a country as small as Australia is bigger than Zillow,” in terms of valuation, Larson said, because not only does the company generate considerable revenue, but much of it is profit. REA Group’s $6.46 billion market cap demonstrates investor confidence in the company’s ability to grow revenue by 25 percent in the last six months of 2014, to $261.5 million, which helped boost net profits by 34 percent, to $94.7 million (all figures in Australian dollars). During the same period (the second half of 2014), Zillow posted a $26.9 million net loss on $181 million in revenue. But Cofano said, point-blank, “We’re not going to be REA” — an assurance also provided last month by News Corp. Executive Chairman Rupert Murdoch at Real Estate Connect New York City. Cofano said little about realtor.com’s future plans, but hinted at upcoming changes on listing display pages. He also noted that Move had been approached by MLSs asking why their agreement with realtor.com should be different than that of any other portal. “It is different. I’m willing to get on a plane and meet with you. We will tell you point by point by point why we are different,” he said. 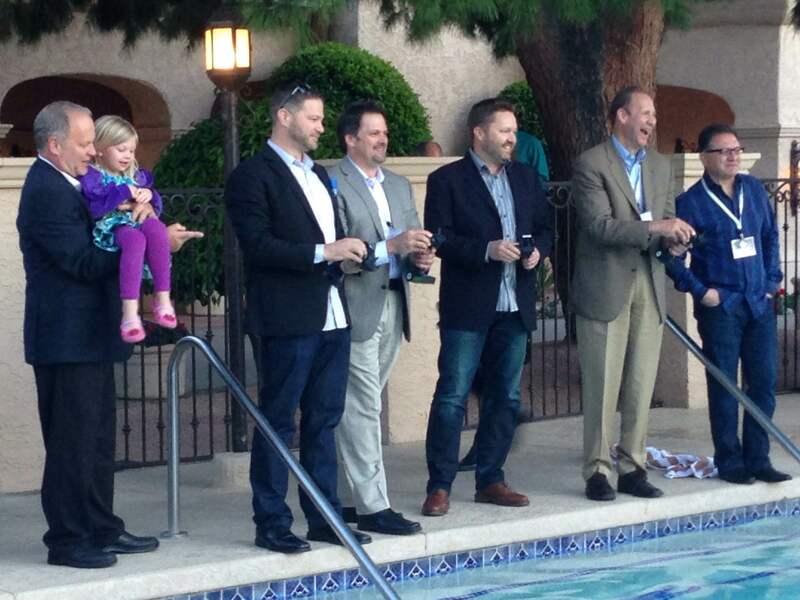 Zillow’s Steve Allen, Trulia’s John Whitney, Homes.com’s Andy Woolley and Move’s Russ Cofano compete in a boat race. After Thursday’s conference sessions, executives representing the four portals participated in a more lighthearted version of their rivalry: a remote-control boat race. Zillow won. Editor’s note: This story has been updated with statistics from REA Group’s most recent report to investors. A previous version of the story included a quote that overstated REA Group’s profits.